It is already two weeks since the annual International Meteor Conference (IMC) took place. This year the conference was hosted by Modra Observatory of the Comenius University in Bratislava and took place in Pezinok, not far from the capital. With 127 participants from 28 countries and fully booked, the conference thanks to its splendid organization, excelled in being a great success. The IMC was just after the General Assembly of the International Astronomical Union (IAU) and attracted an extra number of professionals. As always: the conference is a great opportunity to meet with participants around the globe, works as magnet, being the ideal place for cross fertilization! Meteor science is one of the very few astronomy specializations were amateurs and professionals have a tight relation. Even today they work together and make use of each other’s work. An excellent example is the visual work which would be impossible without amateurs as they take care of the majority of (if not all) observations. All visual recordings are stored in a central database and together form the biggest long-term archive on meteor shower activity and due to the standardized observing method, provide a wealth of information for shower evolution studies and models, including prediction work. Video networks, I think, are the other area where amateurs significantly contribute. But video technology quickly evolves, resulting in many different technical solutions, and thus standardization unfortunately is much more difficult. This is -even today- the power of visual work! This year the conference was preceded by two workshops: one on visual data reduction; the other one on spectroscopic work. For conference participants that could not attend these workshops, exciting summaries were given in the main conference. Great highlight was that the new visual ‘R’ analysis software was applied to a very recent set of data: the Perseids 2018, which soon will result in a paper in WGN, being very encouraging news. Spectroscopy among amateurs has since long been a rare field. Since a few years, it gains interest, thanks to the availability of sensitive video cameras and relatively cheap gratings. A link to the scientific use (and needs) still seemed missing and many questions arose. The spectroscopy workshop exactly focused on this, dug into problems with calibration and which spectral resolution is needed to contribute to our scientific understanding. Two great talks clearly showed what can be done, if next to flux and orbital elements also the spectral composition is known. Fireballs and meteorites are evidently becoming an increasingly large topic: they are ‘hot’. Fireball networks, hunting for new meteorites, grow and gain in quality. Knowing that worldwide there are not more than a few tens of meteorite recoveries that also have an accurate orbit, explains maybe why: the combination of meteorite and orbit is very valuable. At the IMC it became clear that fireball cameras still gain in accuracy, and networks spread around the world. Although meteorites are not precisely our topic, nor are asteroids and comets, the chain comets/asteroids – meteoroids – meteors – meteorites is an exciting one, as together they learn so much on the formation of our solar system. The space (sample and/or recovery) missions to asteroids and comets add (new) knowledge to our parameter space. The IMC also showed how our modern ‘social network’ world (a.) 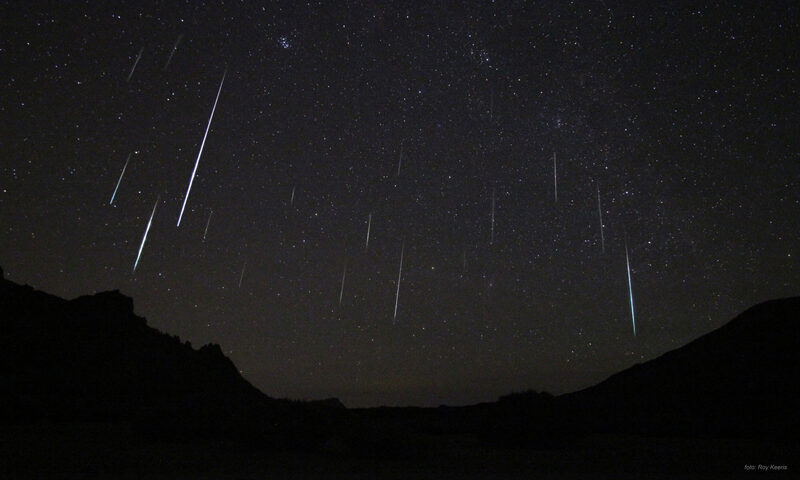 creates enhanced awareness among the public on meteor showers and fireballs and (b.) provides a source of new information (‘citizen science’). The largest fireball event captured by the IMO fireball form contains no less than 2000 reports! Meteor science, as other areas of astronomy, both contains observational work as well as theoretical work (models) to explain these observations, gain our understanding in, e.g., predicting new events. A typical IMC now covers it all: observations (balloon missions!, automated radio data analysis), simulations (a new realistic meteor shower simulator), neural network software development, high-tech lab experiments and even backyard experiments with an air cannon! This year we learned on meteorite ablation, that most shower meteors fragment, and almost all of them decelerate. Hyperbolic orbits are still frequently seen and the Geminid shower, while already being the ’shower of the year’ will keep doing that by slowly but steadily increasing its activity. If you are interested, then put the IMC 2019 in your agenda (Bollmansruh, Germany, October 3-6, 2019), and maybe also Meteoroids 2019 (June 17-21, Bratislava, Slovakia). This tri-annual conference is a real professional one but has one session on amateur work too, which so well illustrates how well appreciated amateur work is. Meteor science indeed is exciting. But we should never forget that meteor astronomy is our hobby, and the fun of it is our biggest motivator. IMCs with their splendid atmosphere clearly contribute to it. Organizers, thanks again for this wonderful event! Did you miss this IMC? Go to the program and check most of the presentations given by the participants. And stay tuned for the Proceedings of the IMC! Tekstbijdrage: Felix Bettonvil. Dit bericht is oorspronglijk gepubliceerd op de website de internationale meteorenvereniging IMO.